If I Stay is an American romantic drama film directed by R. J. Cutler, based on the novel of the same name by Gayle Forman. The film stars Chloë Grace Moretz, Mireille Enos, Jamie Blackley, Joshua Leonard, Stacy Keach, and Aisha Hinds. New York based Indie Rock producer Adam Lasus produced six original songs and a cover of the song "Today" by Smashing Pumpkins, that were performed by the fictional band Willamette Stone in the movie led by Jamie Blackley's character Adam Wilde. 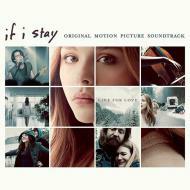 Other songs on the If I Stay soundtrack include tracks by Sonic Youth, Beck and Tom Odell.